No Blend Frozen Mudslide – A decadent combination of rich chocolate and creamy vanilla! 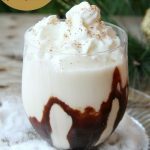 A delicious ice cream drink for adults – no blender required! Place ice cream in microwaveable bowl and heat at 15 second increments until it softens – almost to melted stage. Mix in coffee liquor, vodka and Irish cream. Squirt chocolate syrup around inside of cup. Sprinkle some nutmeg on top.